Recent publicity given to Yesha Council Chairman Danny Dayan by the New York Times has angered J Street, but Dayan takes it in stride. 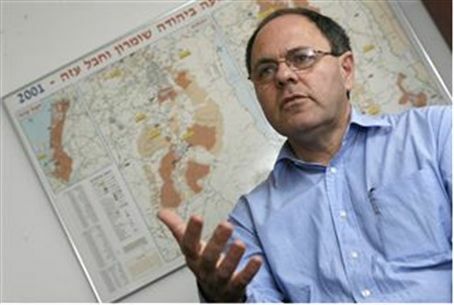 Recent publicity given to Yesha Council Chairman Danny Dayan by the New York Times has angered leftist groups in the United States, but Dayan is not bothered by that fact. The article focused in part on Dayan’s pragmatic approach to the issue of Israeli settlement in Judea and Samaria, with even opponents such as Peace Now’s Yariv Oppenheimer noting that Dayan can “speak to the public with a much more sensible argument and a much more moderate image” than more strictly ideological counterparts. New York Times writer Jodi Rudoren noted that Dayan’s approach has created some hostility among purely ideologically motivated youth, with some terming him a “danger to settlements” or even a traitor. In the course of the profile Dayan revealed his long-term plan for Judea and Samaria: continue to build alongside Palestinian Authority Arabs, maintaining a cold peace. Then, when there is a regime change in Jordan, Israel and Jordan can work out a form of joint rule in Judea and Samaria. The profile followed an op-ed Dayan wrote for the Times, in which he said that a two-state “solution” is no solution at all. Dayan's article irritated some American leftists, including many Jews. The day after the article appeared in the New York Times, the J Street organization launched a special page on its website, in which it gathered angry responses to Dayan’s “chilling”, as they put it, article. He calls it facing the facts. While J Street prides itself as being “pro-Israel” and “pro-peace,” many, if not most, Jewish constituents believe that the organization actually undermines the interests of the State of Israel and Jewish people. Numerous Jewish leaders and organizations have publicly disassociated themselves, altogether, from J Street’s rhetoric and policies. The group has also hidden the fact that it receives hundreds of thousands of dollarsin funding from Pro-Palestinian Authority billionaire George Soros, who once said Israeli and American policies fuel anti-Semitism. Last month the group targeted congressmen Joe Walsh (R-IL) and Allen West (R-FL), saying they are "not pro-Israel" because they support Israeli annexation of Judea and Samaria. Dayan himself remains unfazed about the anger directed towards him. He told Arutz Sheva on Thursday that he attaches great importance to bringing the position of the residents of Judea and Samaria to the world. Dayan has been invited to participate in the prestigious Saban Forum in New York in November, and he said he sees such visits abroad as a most important task.